Do YOU suffer from occasional or chronic insomnia? The nights laying awake, looking at the clock every half hour and maybe finally falling asleep about an hour before you know you have to get up anyhow, feeling utterly exhausted the next day…Only to have the scenario repeat the following night! If this sounds like you, then you also know the price you pay for the poor sleep. The extra hunger the next day, the sluggish brain, the inability to focus and concentrate. It affects your job, your relationships, and your overall health. “Sleep Deeply With Hypnosis” recording is designed to eliminate underlying subconscious reasons for your insomnia while enhancing your ability to fall asleep, and stay asleep. Program yourself to super-boost your positive mind-set and feel AND BE great! Get the rest your mind and body need, naturally. No longer fight to get the rewarding sleep you need! Be secure and comfortable each night you sleep! Wake up each morning feeling rested and refreshed. Hypnosis is extremely effective in eliminating insomnia, chronic or occasional. In fact, a common side-effect of hypnosis is better sleep–even in people who don’t have insomnia! Paired with suggestions to eliminate insomnia and create sound, deep, restful sleep, hypnosis is one of the most effective methods for addressing insomnia, and it’s all drug-free and natural. The gift of waking up refreshed and full of energy in the morning. Listen to it just once as you fall asleep, or put it on repeat to keep you in the brainwave of sleep all night long, if waking at night is an issue for you. 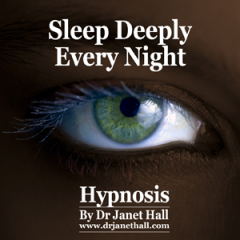 Relax and let Dr Jan’s hypnotic reassurance take you off to a wonderful land of peaceful slumber and awaken invigorated, refreshed and energised. So, if you’re serious about wanting to stop sleep problems then you need to get a copy of “Sleep Deeply With Hypnosis” right now!